Please see Terms of Purchase at bottom of this page before purchasing. Walrus Pumps is an ISO 9001 Certified Manufacturer that has been making pumps for 37 years. We have excellent pricing on these pumps! Call us at 210-568-3628 for our below list pricing. This is a good economy pump at economy prices for Repressurization applications and boosting household water pressure. Water supply and pressure boosting in residential, commercial, and light industrial applications. Use for potable water or other clean non-corrosive liquids. Automatically turns on when you open a faucet and turns off when you close the faucet. Shop responsibly. Consult with a pump or plumbing professional before purchasing any pump to be sure it matches your particular application. No returns on pumps. We do not sell used pumps. TIP: For very critical pumping applications, especially in very remote areas, consider having a duplicate backup pump on hand. We also feature the premium Goulds Aquaboost II Variable Speed Pumps. Made in USA, all Stainless Steel construction, accepts almost any input pressure, features a programmable output pressure, soft start motor, variable speed technology maintains the pressure you desire while only running the pump at the slowest speed needed. Highly recommended. Call us at 210-568-3628 to order. The TQ is a complete, all-in-one unit, consisting of pump, motor, and electronic controller. The built-in electronic controller provides constant pressure which ensures that the pump starts automatically when water is consumed and operates continuously until water is not required. Compact design and fairly quiet operation make the TQ series suitable for many applications. The TQ is constructed from the top quality corrosion resistant materials. The TQ has an automatic restart function. When the liquid temperature is over 131 F, the overload relay will trip and automatically stop the pump. Restarting will be attempted when the liquid temperature drop to 104 F.
The motor has built-in thermal overload to protect against high operating temperatures, dry running, and over current. The TQ has an Anti-Cycling Feature which prevents the pump from continuous starting and stopping when you have a dripping tap or minor leak in your plumbing system. On installations with suction lifts over 3 feet, a good quality foot valve should be fitted. Shaft is made of type 410 stainless steel (TQ200/400/800), or Type 304 stainless steel (TQ1500/2200/3700). 1 Year Manufacturer's Warranty against defects. Imported product. Shop carefully, as we do not accept returns on pumps. We do not re-sell used equipment. 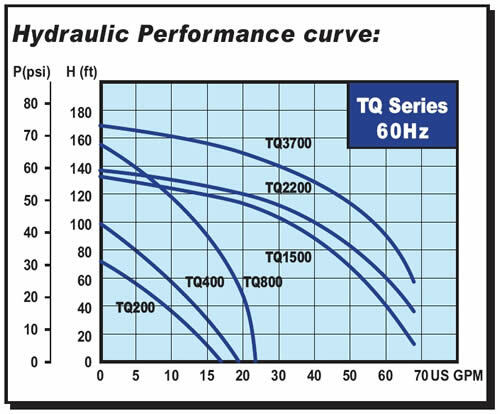 Click Here for the detailed TQ Series Spec Sheet showing Suction Lift Performance, Discharge Pressure, Dimensions, etc. Click Here to visit the Walrus Pumps website for more information. View the Instruction Manuals and see "TQ US Catalog" to view the technical charts. The TQ200 pump will typically add about 31 PSI to whatever your Intake Pressure is. The TQ400 pump will typically add about 40 PSI to whatever your Intake Pressure is. The TQ800 pump will typically add about 67 PSI to whatever your Intake Pressure is. The TQ1500 pump will typically add about 58 PSI to whatever your Intake Pressure is. The TQ2200 pump will typically add about 60 PSI to whatever your Intake Pressure is. The TQ3700 pump will typically add about 72 PSI to whatever your Intake Pressure is. Your Pump Intake Pressure needs to be about 5-6 PSI less than the stated Auto Startup Pressure Setting shown in the red box in the chart below. You must install a pressure regulator before this pump if you need to lower the pump's intake pressure. The Output Pressure of these pumps may be lowered by installing a pressure regulator before the pump Intake. Remember that the water pressure going into the pump must be about 5 -6 PSI lower than the published Auto Startup Pressure Setting for each pump as shown in the chart below. Do not allow your pump to "run dry" as this will lead to burnout of the motor. Be sure you have an adequate water supply that will keep your pump filled with enough water at all times. If you follow these pumps with a Pressure Bladder Tank, you must adjust and match the pressure in the Pressure Bladder Tank to that of the pump. This information is listed in the Instruction Manual of each pump. Walrus Pumps highly recommends that only a pump professional make any adjustments to the factory setting on the adjustable pressure switch and flow switch! The instructions provided in the manual for this procedure are really intended for professional pump installers only. If you use these pumps to "lift water" from below ground level, you may need to install a foot valve. NOTE: Please read the TQ Series Instruction Manual before purchasing your pump. Maximum Ambient Air Temperature: +104 F.
Liquid Temperature: +39 F - +104 F.
Before using the pump, be sure inlet pressure setting must be lower than factory pressure setting. Call us for our excellent below list pricing! 210-568-3628. Multistage design provides steady, quiet and vibration-free operation for years of trouble free service. All parts in contact with water are made from corrosion resistant materials. Capable of transferring both plain and salt water. Inlets and Outlets are Type 304 stainless steel, Shaft is made of type 316 stainless steel. 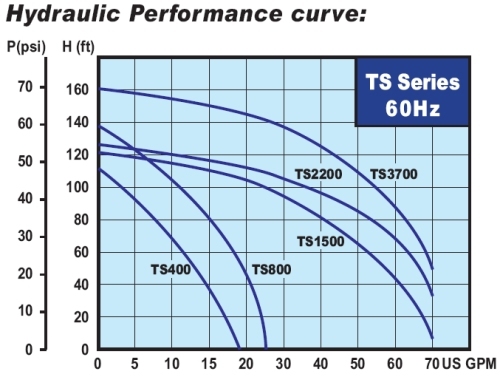 Click Here for the detailed TS Series Spec Sheet showing Suction Lift Performance, Discharge Pressure, Dimensions, etc. Terms of Purchase: Purchase of these pumps means you consent to these terms including the Store Policies . Please shop responsibly. Please inspect your merchandise for any shipping damage immediately upon arrival. This is important for getting a refund and also so that if your installer damages anything he can't tell you that "it came like that". It is your responsibility to have a qualified water service professional or licensed plumber install these units for you to minimize the possibility of error, overall system design error, and also installation damage. Let the professional installer assume the risk and be liable for installation damage, and try to get at least a 30 day guarantee on the install work. Select, Use and Install our fine products entirely at your own risk. Prices are subject to change without notice. We reserve the right to change incorrectly priced items. 1 Year Manufacturer's Warranty against defects only. Customer will have to uninstall pump and pay the return shipping of the pump to the manufacturer for inspection, and IF the manufacturer determines that the pump has failed due to a manufacturing defect, the manufacturer will either replace the pump or issue a refund. Use entirely at your own risk. We are not responsible for product failures or any damages (incidental or consequential) suffered as a result of the product failure. We are not responsible for your plumbing bills. Do not allow pumps to "run dry" as this will lead to burnout of the motor.